Javelin exosuits are one of the core features of Anthem. These mini-mechs represent classes, and you’ll be able to switch classes by using different javelins. However, at the beginning of the game, you’ll only get to choose one. Access to other javelins will be possible at a later point, but you’ll need to unlock them. 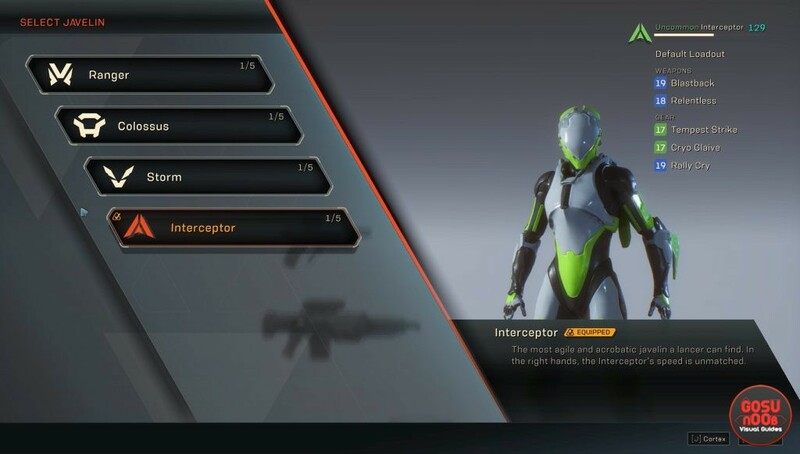 If you’re wondering when they become available, this guide will show you how to unlock new javelins in Anthem. The whole thing is actually quite simple. You’ll unlock new javelins automatically as you progress through the story. You’ll choose your first one after the tutorial. Once you hit level 12, you’ll get to pick another one. The next choice becomes available at level 20, while the last suit unlocks when you reach level 28. That’s all there is to it – simply keep playing the game and you’ll eventually get them all. The next big question is, obviously, which javelin you should pick first. This depends on a lot of factors. The classes in Anthem aren’t as rigid as in most games – each one has both offensive capabilities and the ability to heal itself. The nuance might be lost on a newcomer, so if you haven’t played any of the betas, it’s probably safest to take the ranger first. It is the most well-rounded of them all. Our second choice would be the colossus, which is Anthem’s version of a tank. It’s bulkier than the others, and if you get past any preconceptions you have about how tanks work, you could have a lot of success with it. Consult our guide on how to play colossus if you need more info. Storm and Interceptor are more specialized, and are probably best left for when you already have a good grasp on how the game in general works.